They feed on a wide range of plant material especially soft leafy material. The wounds they leave make the plant more susceptible to disease. Timings Slugs are most active when conditions are moist and cool. What are Slugs and how can I identify them? Slugs are from the Gastropod family and is the general name given for those that do not have a shell. There is approximately 40 different slug species in the UK and they are a variety of colours. They move around on one slimy muscular foot in a wave motion, with the slime they produce aiding their movement over a variety of surfaces. Slugs will have two pair of tentacles on their head - essentially one pair for seeling / smelling, and the second pair for feeling and tasting. Slugs are able to retract their head back into the body for protection when under threat or if they are stationary as they are often a food source for other wildlife. Slugs are most active when the conditions are moist and cool. They are also much easier to spot at night, if you go outside with a torch when it is dark you will stand a much better chance of picking them off. In the day time you can look for the shiny, slimy trails that they leave behind. Slugs can cause a large amount of damage as they will eat through leaves, and they can also damage stems. 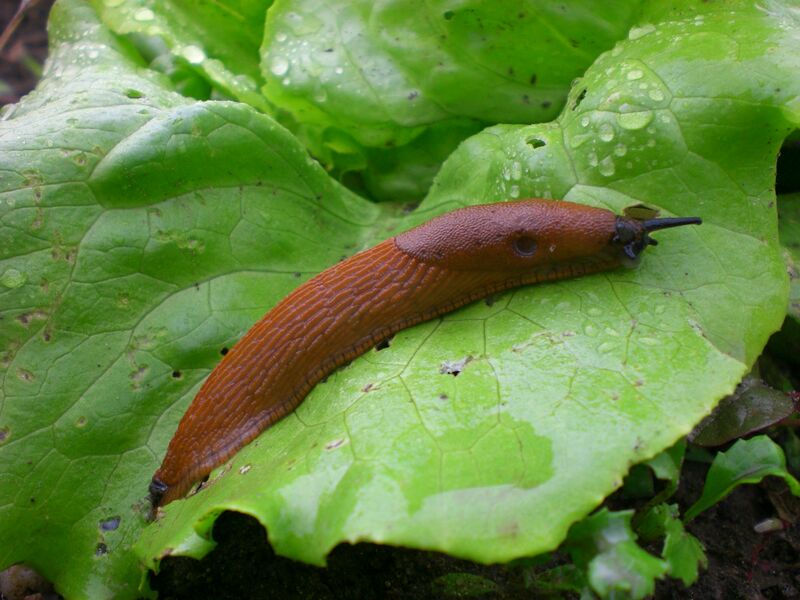 Slugs cause millions of pounds worth of damage to agricultual crops every year across the country. They feed on a wide range of plant material especially soft leafy material. They have a rasping tongue whcih they use to feed. Each adult slug can lay up to 50 eggs into the soil or other decaying matter. The wounds they cause are an open invitation for disease which can often kill or seriously harm the plant. Plants that are particularly suspceptible are Hostas, lettuces, cabbages, cauliflowers and strawberries. Unfortunately, slugs can survive the winters by burying themselves in the soil when the temperatures begin to drop.